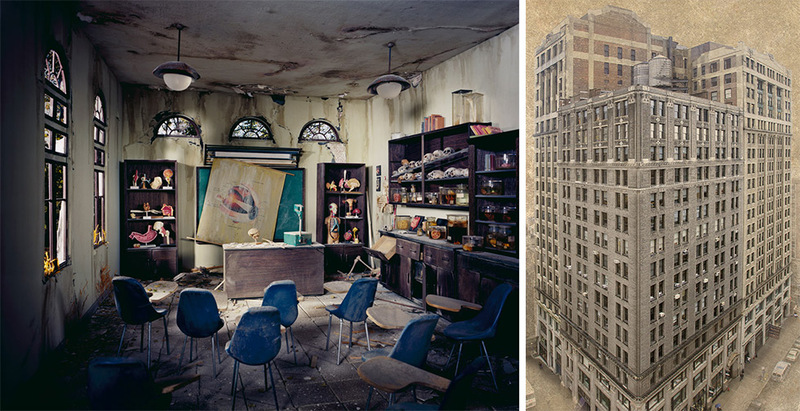 Image (left): Lori Nix, “Anatomy Classroom,” 2012, Archival pigment print. Image (right): Marc Yankus, “Three Buildings,” 2013, Archival pigment print. Lori Nix and Marc Yankus’ work is featured in “Of Time and Buildings” at the Art Gallery of Guelph, September 17 – November 1, 2015. Other artists include Feng Bin, James Casebere, John Divola, Susan Dobson, Odette England, Kenneth A. Hedrich, Eirik Johnson, and Jeff Chien-Hsing Liao. Curated by Alison Nordström, “Of Time and Buildings” considers space, place, and time as expressed in 45 photographs created before and after the digital turn. The historical works depict buildings of all types—from shacks to skyscrapers. The contemporary works explore buildings that no longer exist, buildings that never were, and buildings for which an imaginary future has been created. Together, the photographs in this exhibition present buildings as fact, memory, and metaphor. The exhibition catalogue, published by Art Gallery of Guelph, includes a foreword by Alison Nordström and an essay by Sarah Bassnett of the John Labatt Visual Arts Centre at Western University.